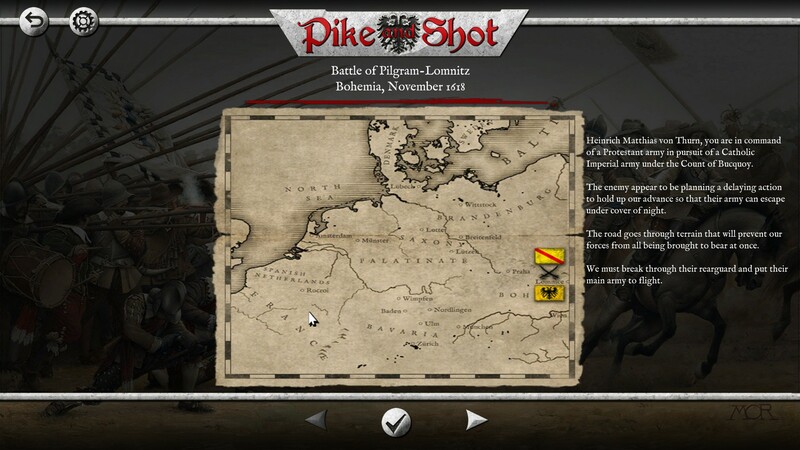 Gott mit uns - A Pike & Shot AAR. 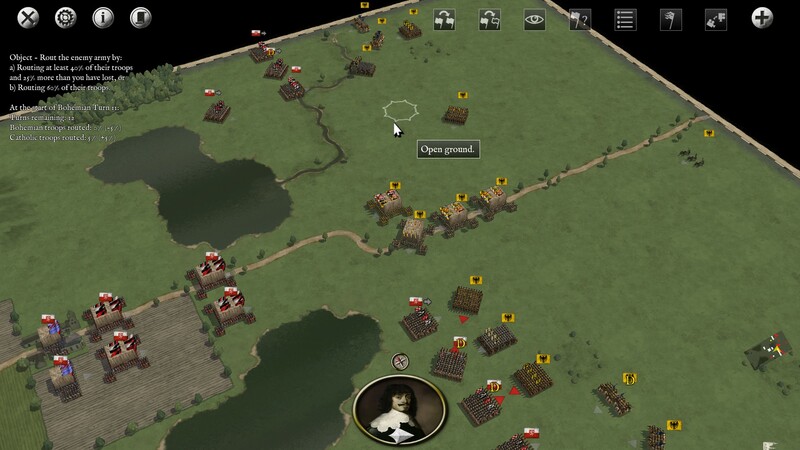 Welcome to "Gott mit uns", an AAR for the Slitherine game Pike & Shot: Campaigns, an amazing title which allows you to play countless battles in the early modern era (from the early 15th century to the late 17th century). 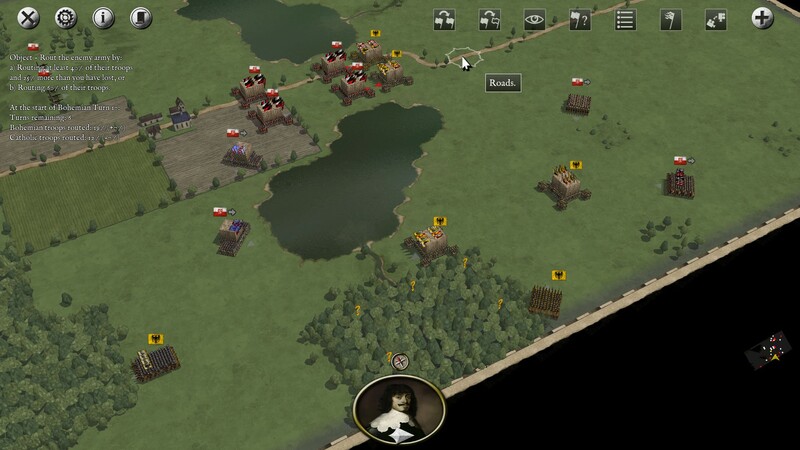 The game allows you to play custom skirmish battles on automatically generated maps, but I've decided to play one of the many available historical battles: part of the Thirty Years War pack, this is the battle of Lomnice, fought on the 9th of November 1618 between the Protestant forces of the kingdom of Bohemia, led by Heinrich Matthias von Thurn, and the Catholic armies of the Holy Roman Empire, led by the Count of Bucquoy. We'll play as the Bohemians. Historically they won, but who knows if we'll be able to best the AI? "Gott mit uns" was the war cry of the armies of Gustav Adolphus, and they were very successful. 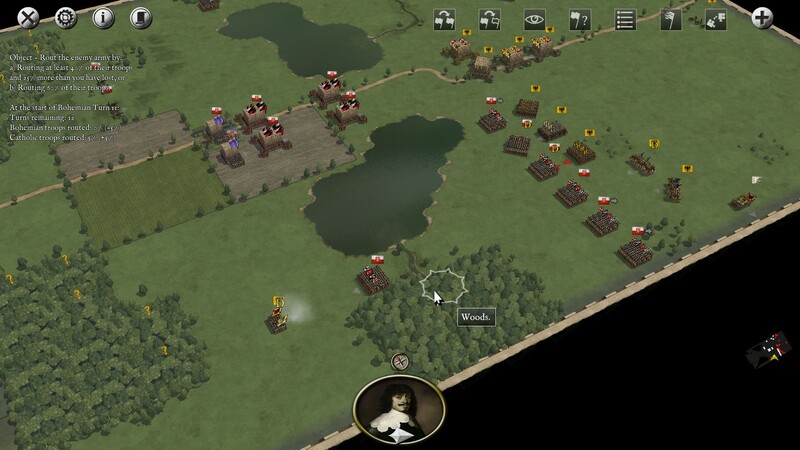 We hope we can achieve victory, but the AI is really good, and we're not too optimistic about our chances: although we outnumber the enemy by a few thousands men, they have the advantage of being on the defensive on an unforgiving terrain. It won't be easy. To make things more difficult, we must achieve the unique goal set by this scenario: we have to defeat the Catholics before the end of the 22nd turn, or the sun will set and our foes will take advantage of the cover of darkness to slip away from our grasp! But let's take a look at our forces, shall we? We have around 14,000 men under our command, of which over 10,000 are infantry, mostly part of our mighty tercios , our "moving fortresses". We have in fact six tercios, four numbering 2040 men, and two smaller ones with just 1050 men. 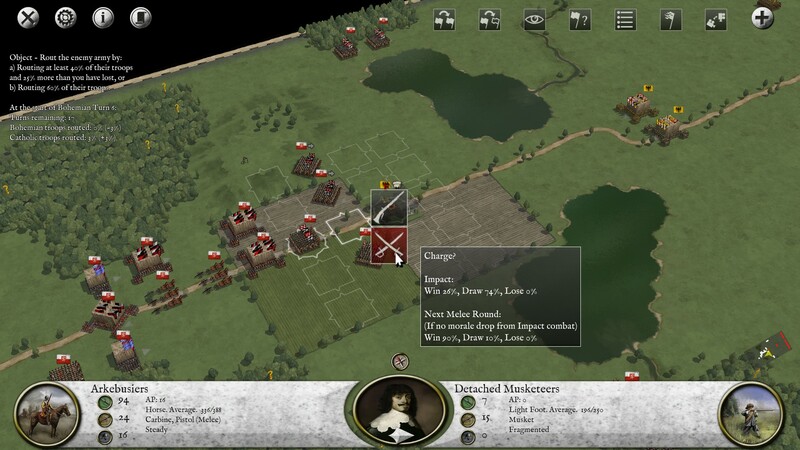 They are formidable units, hardy and powerful, composed of pikemen and musketeers (with a 50:50 pike and musket ratio) and as such capable of unleashing terrible close range volleys and to lead terrific frontal attacks, but also slow and lacking in maneuverability. They will be easy targets if picked on by smaller and faster units of skirmishers, and can rapidly lose cohesion on bad terrain such as swamps or woods, but on the other hand they are immune to flank attacks. They are arguably our most important units, and will bear the brunt of the attack. We'll keep the two smaller tercios in our rear as reserve, as they are only Rawly trained, while our four experienced tercios will follow the vanguard. But enough with the infantry: what about our cavalry? We command eleven regiments of mounted arkebusiers, each numbering 384 men. They are our mobile forces, with which we'll scout ahead and continuously harass the enemy, and possibly chase our foes once they are routed. We shall have to employ them optimally if we want to rout the enemy before nightfall. Last but not least, we have two batteries of artillery (Medium guns), capable of unleashing devastating firepower. They are currently limbered, and their correct placement is of mandatory importance if we intend to be the winners on this battlefield. 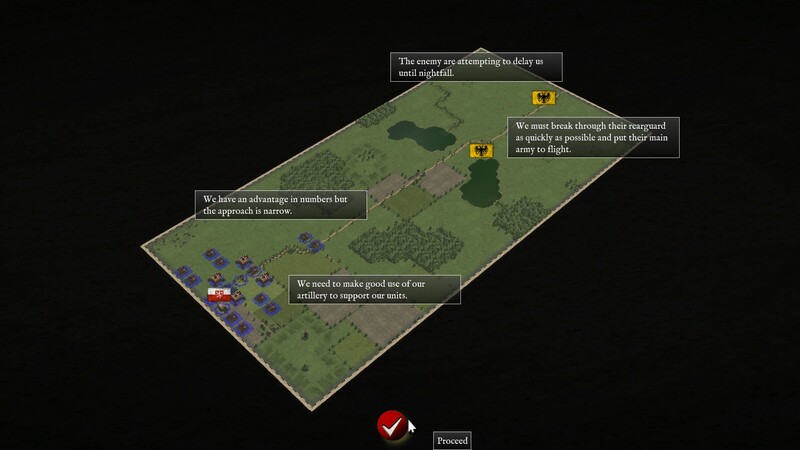 They can cause high casualties, and can easily Disorder enemy formations, creating large gaps in their ranks. Now let's take a look at the map, and we'll then come up with a battleplan. 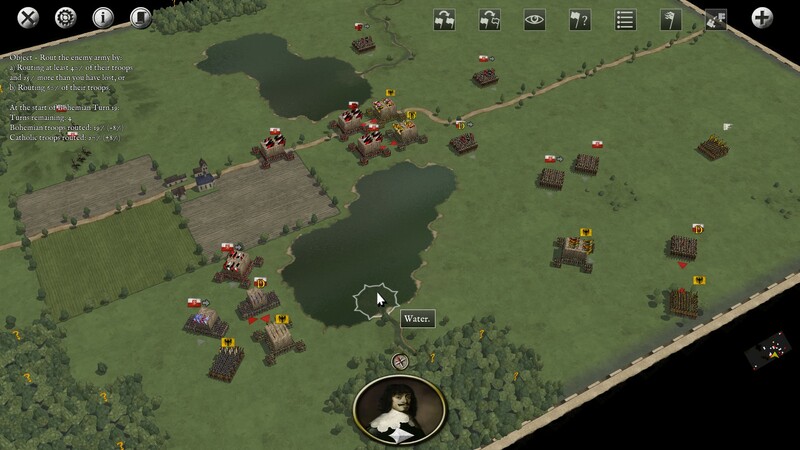 Terrain is extremely important in Pike & Shot, and battles can be won and lost because of troops placement. This particular battlefield is a tricky one: it presents not one but two bottlenecks. 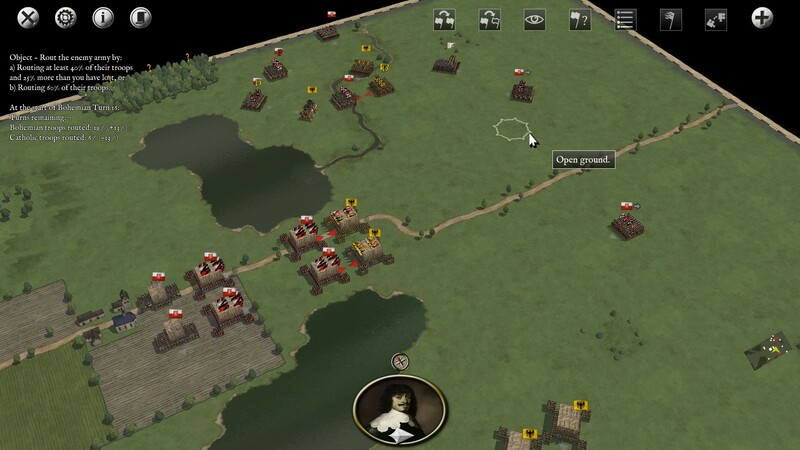 First, we'll have to march between two small woods, then past the small village of Lomnice at the center of the map, once again we'll have to cross a narrow gap between two large ponds, bordering swamps and muddy terrain which will inevitably slow our troops down. North and south of the ponds, there are two streams, and maybe we can turn them to our advantage. We have no real intel on the Imperial army's formation and position, but we know we outnumber them. We can expect them to have tercios of their own, as well as mounted units of fast hussars and heavy kuirassiers: most likely their cavalry outnumbers ours. 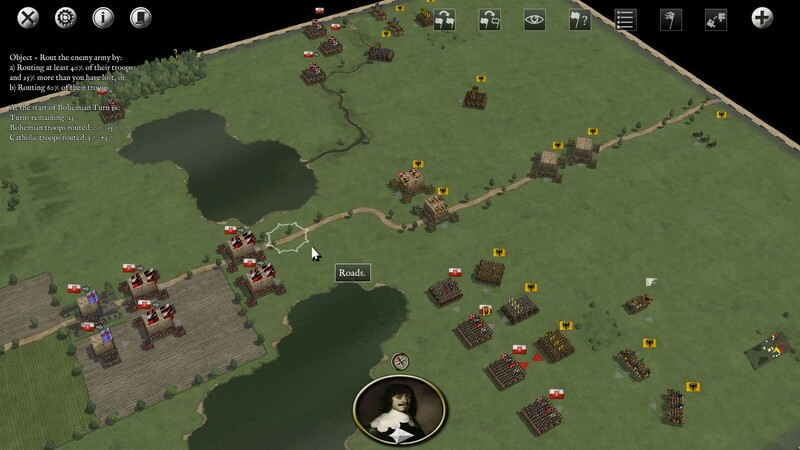 If the enemy commander is smart, he will have placed skirmishers in the woods in front of us as well as at Lomnice, in order to buy time and slow our advance. Our plan is to split our cavalry: the Orange group will be our vanguard, chase any enemy unit out of the woods, and then push on to take Lomnice, while the two Red groups, our wings, will pass respectively north and south of the two small woods, then continuing and stopping behind the two streams: they will form excellent defensive lines, at which our cavalry might be able to confront the Imperial one. The infantry (Light blue group) will follow after the cavalry, and will advance frontally, past Lomnice, following the road to engage the Imperial tercios. We'll keep the two smaller tercios as reserve (Green group). I intend to place our artillery (Black group) on the hill to the north of Lomnice. Hopefully we'll get there in time, as it would make an excellent position. Due to its altitude, our cannons will be able to hit the Imperials hard. 1) Winning the exit to the gap between the ponds. In order to take advantage of our numerical superiority, we must push them back past the bottleneck at the ponds. By accomplishing that, we'll likely win the battle. 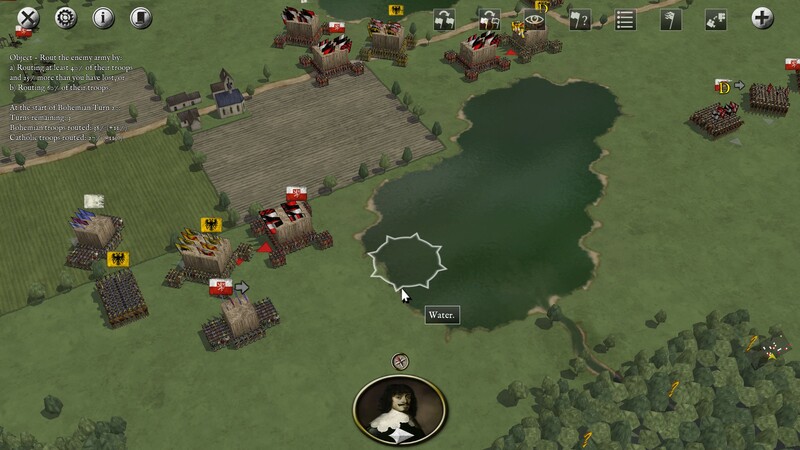 2) Artillery placement. We need to get our guns in position as fast as possible. Landing some good shots on the enemy before our tercios clash with each other is vital. 3) The cavalry clash. Even if our tercios defeat theirs, we'll still need our cavalry if we want to exploit this victory. We need our cavalry to survive the clash with theirs, and it won't be easy as it's more heavily armored and more numerous. But now enough talking, let's get started! Re: The Battle of Pilgram-Lomnitz. As per our plan, we immediately push ahead with the full strength of our cavalry and as expected, we meet some resistance in the woods. 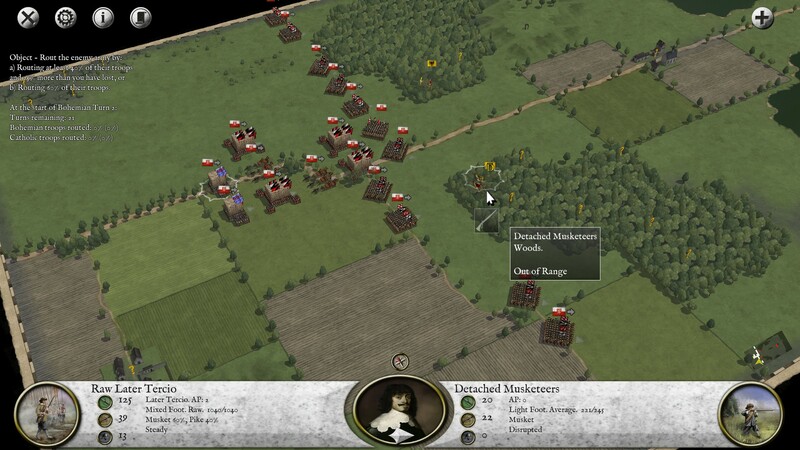 The enemy has detached some units to slow us down, but it's not too hard to push them out and rout them. Our many regiments of mounted arkebusiers surround them, their numbers too great for a few hundreds of detached musketeers to resist. Before long, they are forced to rout. While some of my cavalry deals with the stragglers in the southern woods, the brunt of my cavalry pushes ahead and south and north of the woods, with the infantry and the artillery trains following behind. The Imperial commander has done his homework! He has indeed left yet another detached unit of musketeers at Lomnice, around 250 men, just as we expected. There's no time to waste: charge them, men! Our cavalry makes short work of the enemy musketeers and secure the village. Our infantry is now free to push ahead with no fear of being constantly harassed. Now, we are close enough to have sight of the enemy army. Four tercios, several regiments of kuirassiers, mounted arkebusiers and hussars, and one battery of guns. Two of the tercios block the narrow gap, two are kept as reserve. It's as we feared. Unless we push them back, our infantry's numerical advantage will be meaningless! All good plans need to be adapted on the go, and this one makes no exception. I had planned to keep the southern stream as defensive line and let them come to me, but since it seems that the enemy is mainly holding back with its cavalry, I order my southern and northern grousp of cavalry to advance past the streams and fire some volleys on the enemy tercios, just like the central group (group orange). In the meanwhile, our mighty tercios advance, and our cannons are unlimbered in position on the hill, ready to unleash hell! But the enemy has not been idle. He finally decides to deploy his own cavalry, and we have no choice but to face them with our own mounted units, while our cannons beging their terrifying bombing of the enemy lines. Our left flank is secured behind a stream but is lacking in numbers, while our right lank doesn't have any kind of natural defense, and will bear the brunt of the enemy charge. 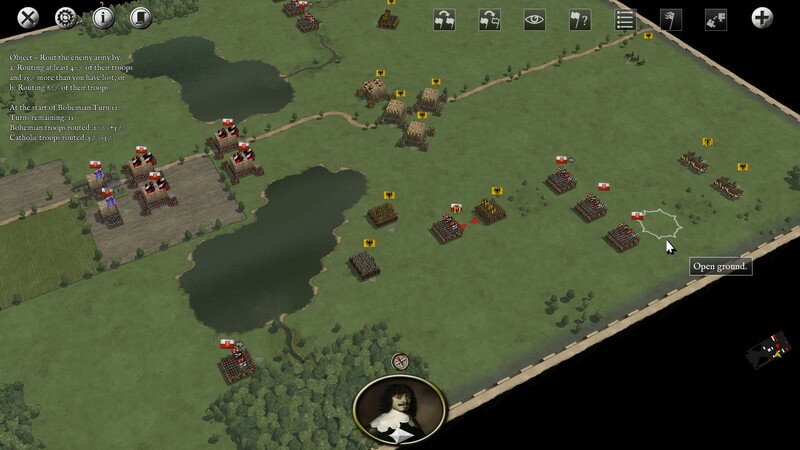 Also, one of my regiments has been Disordered by an artillery volley, and is currently a weak point in our formation (you can see it by looking at the yellow D on top of the unit). To make things even worse, a unit of elite Kuirassier is about to charge our weak point. We can only hope that they will hold their ground long enough, or this might be a disaster. While the cavalry clashes, the tercios get closer, and beging exchanging some volleys at a certain distance. More bad news. The unit of musketeers we had defeated previously in the woods has regained enough Cohesion to return to the battlefield. We believed them routed, but they are back! Good news are that I had left a regiment of cavalry as reserve, fearing that something like this might happen. Bad news is that now I can't employ my reserve where it's truly needed, as the Imperial cavalry outnumbers mine. Things aren't going well. My left flank is forced to cede ground, having to retreat behind the stream, while my right flank is sufferng. 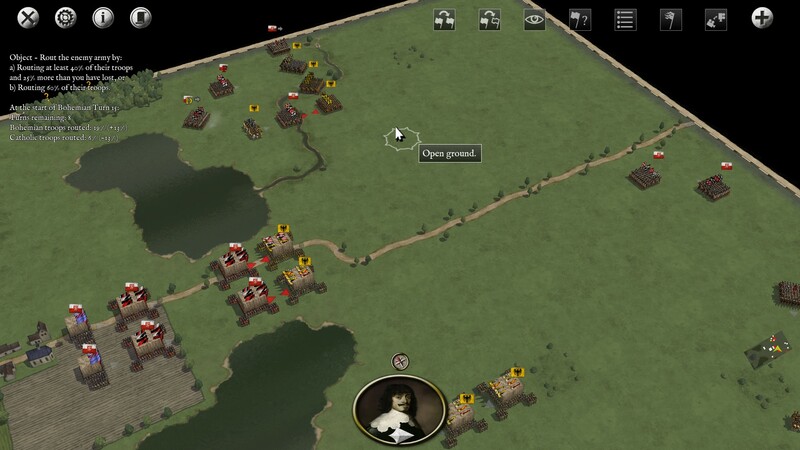 I don't order my tercios to advance yet, preferring instead to weaken the enemy position with musket and cannon fire. 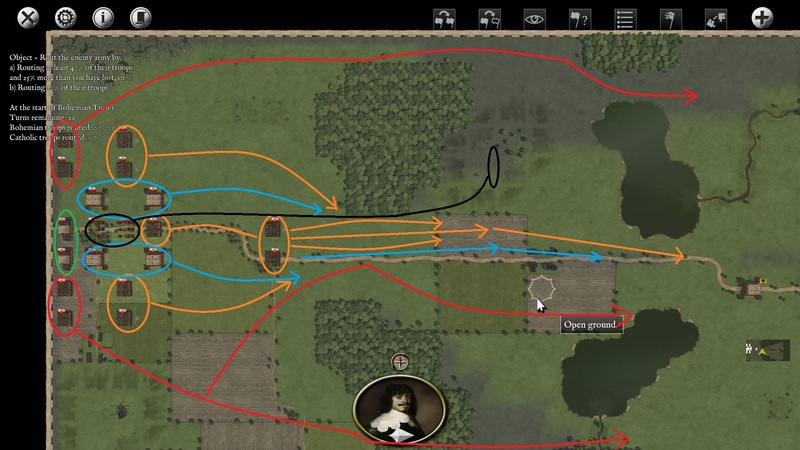 A turn passes, and the right flank collapses completely in two different charges. To the right, my arkebusiers manage to push the lighter hussars back, while on the left of the right flank the more powerful kuirassier rout and flanks my cavalry. This is potentially bad, but it opens a great opportunity for us: the way to the enemy artillery is clear, and we can make short work of it! 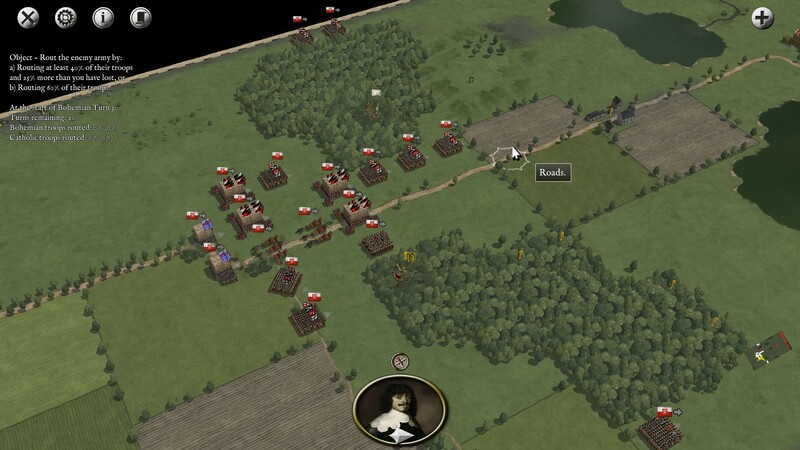 Then, we can rush in help of our left flank at the stream, attacking the enemy cavalry from the rear! 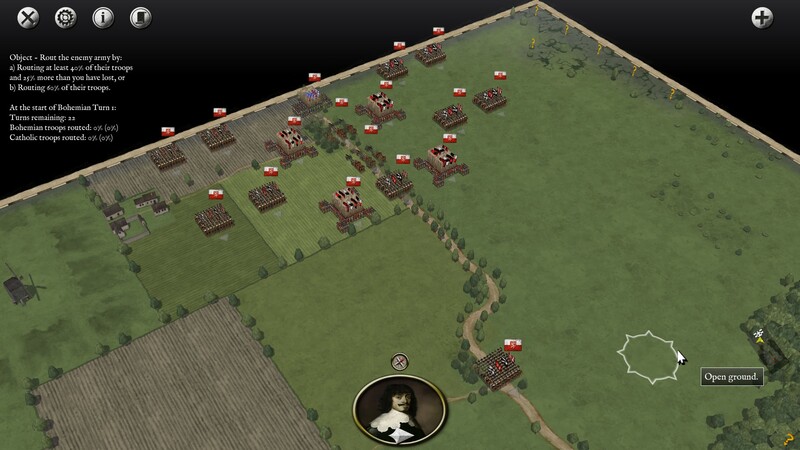 Finally we order our tercios to engage the enemy, and a mighty clash ensues as hundreds of pikes clash with each other. The regiments of our cavalry which managed to break the right flank charge and capture the enemy artillery, but the Imperial commander decides to deploy his reserve tercios to our collapsed right flank. Our left flank is barely holding. It's being pushed back, and won't last for long, as one group of hussars managed to get behind our lines and will soon attack our cavalry from the rear. My cavalry will soon be forced to rout unless my reinforcements get there on time. Luckily, crossing the stream took its toll on the enemy, and the enemy kuirassiers have suffered heavy losses, and are now disordered. Smelling an opportunity, I order my artillery to focus fire on them. The unit of Hussars which had managed to get behind our lines is unable to attack us from the rear as it's engaged by one of my units which had been pushed back! They are disordered and have suffered heavy casualties, but still won't retreat. 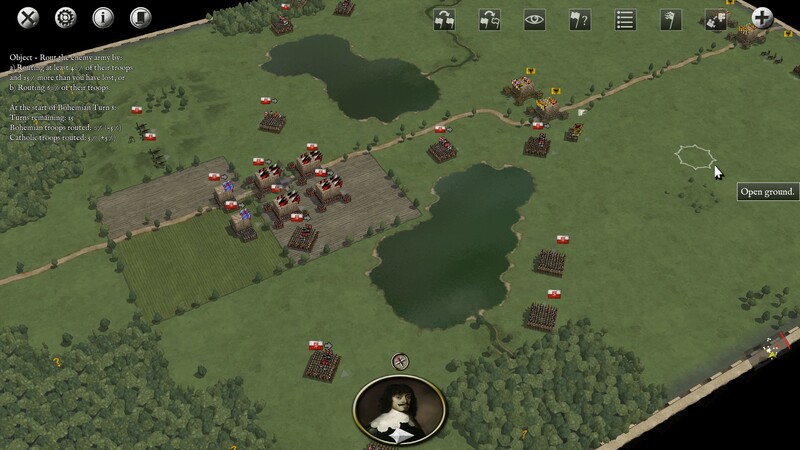 Instead, they perform an heroic feat which might likely decide the fate of this battle, and prevent the enemy from collapsing our left flank, buying my cavalry more time. Finally, the relief forces arrive, and caught between them, my still resisting cavalry and the heavy artillery bombardment, it seems the enemy has had enough and retreats. The battle for the left flank is won. Things aren't going so well on the right flank though. The enemy has broken past the stream with several kuirassiers, and even the tercios are now advancing, threatening to flank me. I engage one of the tercios with my cavalry and skirmishing tactics, but the second one continues its march. Therefore, I command my reserve tercios to march south and engage the tercio on open terrain. Unfortunately I make some mistakes in my maneuvering, and I end up facing the enemy tercio (supported by the kuirassiers) with my rawly trained reservists, with my more experienced men behind them and unable to intervene. Meanwhile in the center things aren't going well. My tercios are unable to make progress. Then, suddenly, the tide of battle takes a turn for the worse and it seems to turn into a disaster. In the center one of my tercios breaks and is forced into a disordered rout, and my whole formation wavers. The same thing happens to my reserve tercios, vanquished by the better trained tercio and the kuirassiers. A battle which was all but won now risks to turn into a general rout! One of the enemy tercios pursues mine, and I'm unable to do anything save bombarding it with my artillery at close range. To the south, my reserve keeps engaging the enemy, but isn't doing too well. Now the men are tired and disheartened, and know that victory won't be theirs today. The sun sets, darkness falls on the battlefield and the enemy slips away. We failed to reach our goal, and allowed the enemy to escape to the north. Still, it's not a complete defeat. We managed to inflict more casualties to the enemy than which we sustained ourselves, and completely destroyed their artillery. We could have caused more casualties and make more prisoners, but unfortunately we couldn't properly pursue the routed units, so most of them escaped. I feel like I've made three mistakes which costed me the battle. First off, the tercios in the center were too clogged up, and when one was forced to fall back, it disordered the others in the reserve as well. Secondly, I failed to properly engage the advancing tercio in the center, preferring to focus my remaining reserve troops on my right flank. And thirdly, when my right flank collapsed my maneuvering was inefficient and I ended up facing a superior, well trained tercio with my raw recruits rather than with my hardened veterans. But this is a challenging game and the AI is very competent at exploiting such mistakes. I don't feel bad for losing. What matters is that we had fun, right? Don't feel too bad, I have tried this one multiple times without success. As you said things look up then a trio fails and defeat is grabbed from the jaws of victory. Good write up and better luck next time. 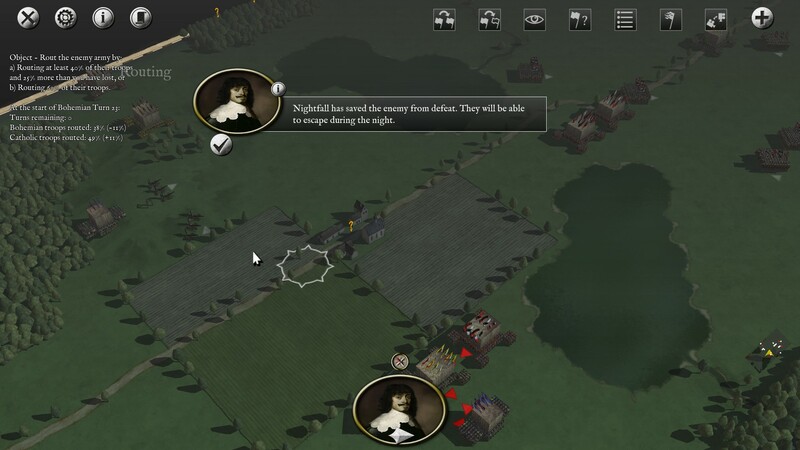 You enjoyed a casualty profit of 100 so you can celebrate the result even though the enemy force was able to retreat at night. According to WW1 Haig doctrine, this would be an astounding victory.